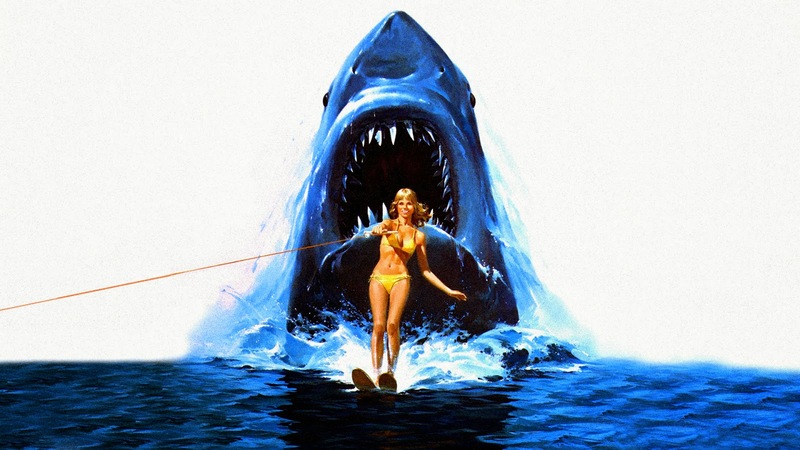 The first summer blockbuster kicked off in 1975 with a little film called JAWS. Now being the very first summer smash hit, it was naturally bound to get a sequel...1978's JAWS 2! It is 4 years after the events of 'Jaws', and the residents of Amity are putting their lives back together with the opening of a new hotel & luxury condominiums. Two divers also come across the wreck of Quint's boat Orca and start taking photographs. A huge shark appears and devoured the divers, but not before one of them got a picture of it. When the camera is found later, Police Chief Brody decided to develop the film. While waiting for the results, a young waterskier is attacked and killed by the shark, who then attacks the tow boat, blowing it up & killing the driver. A killer whale carcass is also found on shore with huge bites taken out of it, which convinces the Chief that a Great White Shark is back in the water of Amity. Later Brody spots the shark from the shark tower at the beach and orders it evacuated, but it turns out to be a school of bluefish. The film is developed that night and Brody has the proof he needs - the photo of the head of a shark. When he presents it to the town council, they simply deny that it's a shark. Brody is fired by the council, with only Mayor Vaughan opposed. Next day the shark ambushes a group of lobster divers, and then heads after a group of kids in sailboats - including Brody's and Vaughan's sons! The shark cripples the boats and kills 2 more people as Brody starts a search on the police launch. Will he be able to locate them before the shark gets to them? Let's be honest, JAWS is one of the greatest movies ever made and didn't need a sequel. However, we got one. One might even say it was a franchise destroyed by sequels (much like the ROCKY series). Although JAWS 2 plays a little slow, it's actually a worthy sequel -- and you gotta love some burnt-up great white action!